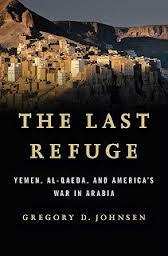 Gregory Johnsen, a native of Nebraska, wrote a book called The Last Refuge: Yemen, Al-Qaeda and America's War in Arabia. The book is divided into three main sections describing the presence of Yemenis in AlQaeda; first, in the war against the Soviets, followed by a phase of "Forgetting" then finally, the rise of a true Yemeni AlQaeda movement. The book just came out recently so it includes the developments that occurred during the Yemeni revolution. You can find the book here. Johnsen writes the blog Waq-al-Waq and has spoken in various events as a leading expert on AlQaeda in Yemen. He also writes for Foreign Policy, the New York Times and is a frequent contributor on NPR. Furthermore, he is a PhD candidate at princeton university.